After trying out the kindergarten level of cooking on the wood stove, I decided to move on to first grade. Joey gave us this beautiful Dutch oven after our power outage last year, and it seemed to be the obvious choice for expanding our culinary arts to roasting a chicken. I prepared the veggies and chicken as I usually do when roasting in the electric oven, settled the fire on a medium-low setting, and then put on the lid of the Dutch oven. I stirred the vegetables a few times so that they wouldn't stick to the bottom --- which I assume is more of a problem in a Dutch oven since the heat comes up from the bottom --- but I didn't have to baste the chicken at all. That made this roast chicken a bit lower work than my oven-roasted chicken, where I try to remember to baste every ten minutes or so. On the other hand, the chicken took about half an hour longer than usual to cook, and I was glad I had a meat thermometer so that I'd know when the meat was safely done. Our taste test declared the Dutch oven roasted chicken and vegetables just as good as the oven-roasted version, but the aesthetics weren't quite as good. I didn't get the crispy skin I usually end up with and the vegetables turned into a mush, making me think that I probably should have cooked the chicken alone for about an hour before adding the root and onion mixture. 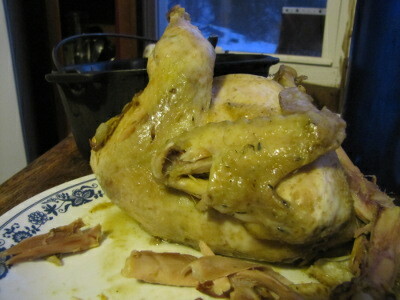 In fact, the Dutch oven roasted chicken reminded me of the results I've seen from folks who roast their chicken in a crock pot. 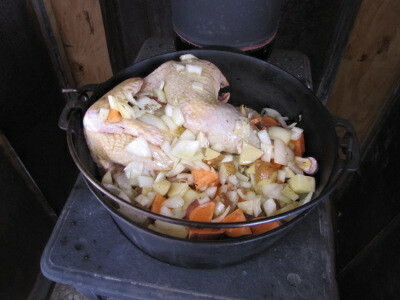 That makes me think that crock pot recipes would be a good place to start when looking for meals I can cook in the Dutch oven on top of the wood stove. Of course true dutch ovens are meant to be used among the coals, with more coals on the lid, and that would make the heat more even for baking. But ours don't have the right sort of lid for that. I've had the best luck with stew-type things. We'd have to have a much smaller Dutch oven to use it among the coals in the stove itself. That might be an interesting thing to try, though, if they make Dutch ovens that miniscule. Clear thinking leads to good and useful conclusion -- Dutch oven on stove cooks like a crock pot, thus - look for recipes for crock pots. Here is a solution to that problem, Dutch ovens were made for HOT Environments all around the the body, that is why they are mostly made of Cast Iron. the solution to your issue is to raise the meat, so liquids will drain and evaporate, creating that dry enviroment to brown the chicken all around. Using a steel rack, a cake cooling rack, or some means to allow the liquids to not come in contact with the meat will allow it to smoke the meat in it's owne juices, creating an intense browning, you will need to watch to ensure you marinate in timely fashions,if needed. This can also be done slowly also. You can place your vegetables in at the beggining, on the rack moving them as needed to fully cook or partically to add finish at the end, if you choose to finish then at tne take then out when Firm to Taste!!!!!! Check your meat to ensure it is not cooking to fast, If so, then remove form heat and allow to steam for about 15 minutes, check your meat temp, if it is close to being finished, removel all liquids cover tight and continue to brown until done!!!! I hope this reads right, next time I will do a Cut and Paste!!! J --- You can say it...I'm obsessively nitpicky. Your last paragraph really thinks out one of the things we most enjoy about our homesteading life. Darryl --- Great idea! When I first learned to roast chickens, the recipe I read told me to put the chicken up on a rack, but I discovered that in our oven that didn't make much difference and I deleted the extra step. But now that you put it that way, I can see how the rack would be especially helpful in the Dutch oven. Next time, I'll try it that way! seeing problem, thinking through problem, devising a test, condusting test, making observations, drawing conclusions and adjusting future methods accordingly. is basically the scientific method. Which is used because it works. Even better, it is about the only method that works reliably! Good point, and intriguing to see the scientific method applied to education.